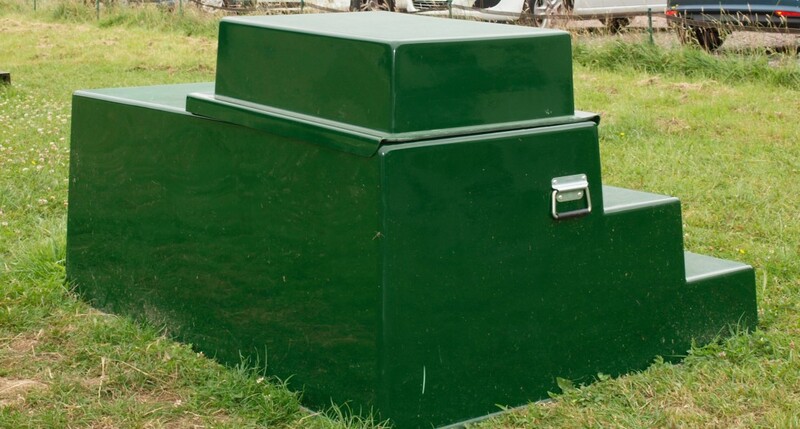 We are very grateful to The Cranleigh Lions Club for the Bursary Award we have received which enabled us to purchase our new mounting block. It is in regular use and is much appreciated by all our riders and volunteers. 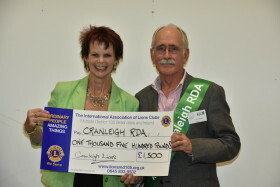 We attended the presentation at Cranleigh School to receive two cheques from The Lions presented by Anne Milton (MP). The successful Lions fundraising events run during the year made the donations possible. They have been generous supporters to us for both our Riding High Campaign and our general funds in the last year. We are very grateful for their support and thank them for their donations. AGM October 2016 – our Award winners! Every year we present awards to recognise special achievement. Congratulations to the winners of the following Awards in 2016 – Kerstin Paul, winner of the Una Mizzen Award for the rider who has achieved most in the year. Emily Jones winner of the Shirley Gates Volunteer of the Year Award . Winners of the Barnes Shield for the most improved ride 2015-16 was awarded to St Dominic’s School our Wednesday morning group. 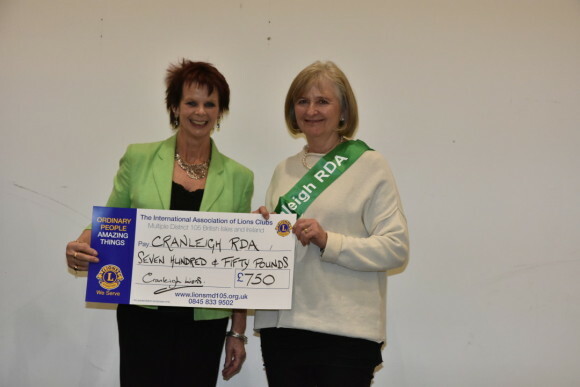 We are very grateful to have been chosen by The Cranleigh Lions Club to be one of the four main beneficiaries of the Classic Car Show this year – they give us wonderful support. We had a super day, the weather was gorgeous and we had no problem keeping the tent standing this year! Our volunteers helped the Lions sell raffle tickets and programmes to a huge crowd. Many visitors called by our tent to learn more about us, what we do and about our Riding High Campaign. 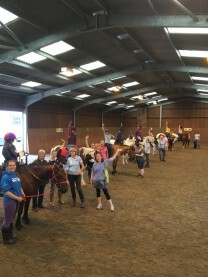 Every summer term eight riders come to Cranleigh RDA from various other groups as part of an RDA National Riding Holiday, for three consecutive mornings to develop their riding and stable management knowledge and skills. Great fun as ever was had by all and excellent progress made. Many were very sad to say goodbye to their ‘ponies for the weekend’. 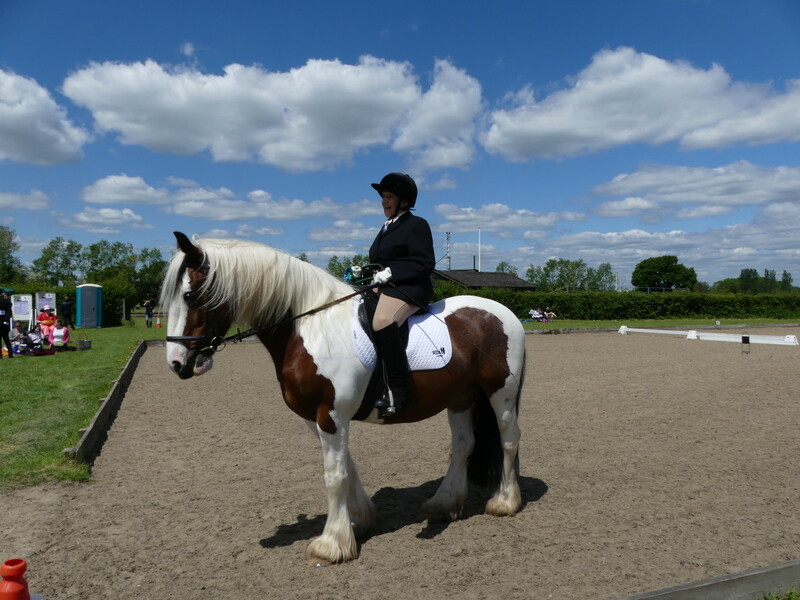 Region’s Dressage Day at Hickstead attracts competitors from RDA Groups across Surrey, Sussex and Kent. This year, we entered 15 riders, giving them the opportunity to ride in a competitive environment, in front of judges and a public audience. Congratulations to ten riders who were placed in their respective Dressage Classes. Preparation involves a lot of hard work from both riders and coaches. Friends and family came to support and loads of volunteers were there to help the day run smoothly. Our Stable Manager and her team of helpers were up before 5am to get the ponies ready and turn them out in top form. 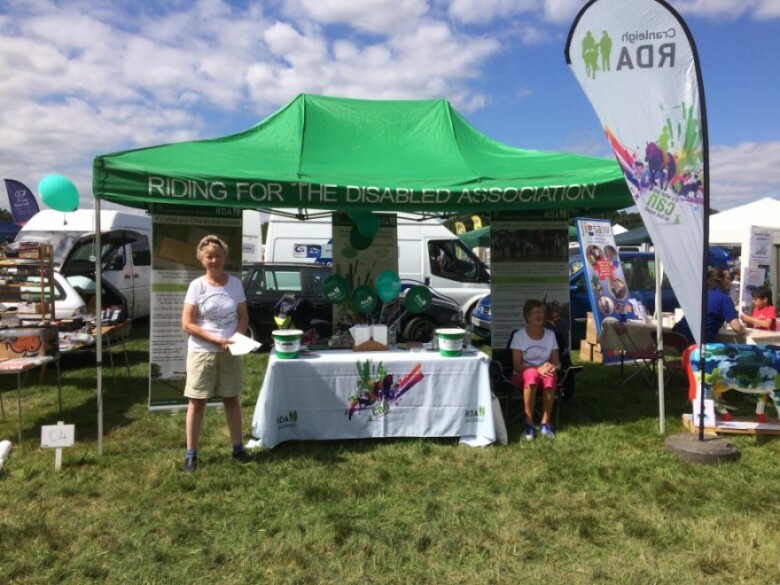 In the summer of 2015 we launched our major fund raising campaign to raise £560,000. The future of our whole operation is in jeopardy because the main barn that houses our stables and social area is nearing the end of its useful life. It is a matter of urgency that we act. To date we have raised £217,000 with thanks to all those who have donated to our campaign so far. Our thanks to Sainsbury’s Cranleigh who have chosen us as their charity partner for 2015/16. They have entered into the challenge of supporting us with great enthusiasm – one member of staff did a sponsored silence which was very well supported in the store! We have had several collecting days outside the store and all monies raised will go to our Riding High Campaign. We are also very grateful to the store for the donations of mince pies for our Riding High presentations as well as carrots and apples for our horses! We like to make the most of Christmas! Maria, our Stable Manager and her weekend helpers decorate the stable yard and the arena so it looks festive. 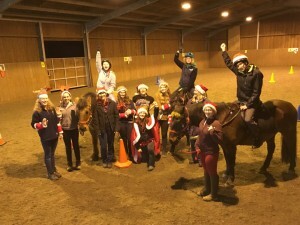 The horses wear tinsel in their bridles and bells on their reins and our volunteers wear Santa hats. 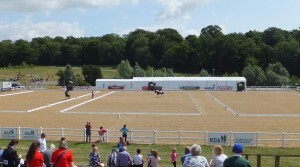 The annual RDA National Championships are held at Hartpury College, Gloucestershire, and riders have to qualify at Regional competitions earlier in the year to take part. Jane Busby rode a lovely Dressage test on Finn, a pony kindly lent at the last minute by Bradbourne RDA Group. A team from Cranleigh RDA also entered the Drill Ride competition (synchronised movements to music) – they were not placed, but they did have an enormous amount of fun practising their routine in preparation for the event! 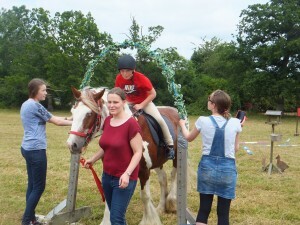 In the last week of every summer term we have our own “Fun Week” when our riders can have a go at gymkhana games and a Handy Pony course. Everyone has great fun and many rosettes are distributed. In 2013 we started having our own dressage days at Casi’s Farm giving the opportunity to many more riders to have a go at a dressage test. We are also able to offer the opportunity to our riders to take part in ‘Dressage Anywhere’. Our riders can do a designated test have it filmed and then submit it for professional marking. The competition is every month and it is possible to qualify for an RDA Championship. It has proved very inspiring and exciting for our riders to gain experience in competing who would not otherwise have had the opportunity. Find out what happened when BBC Countryfile presenters Helen Skelton and John Craven visited Cranleigh RDA in January 2014.